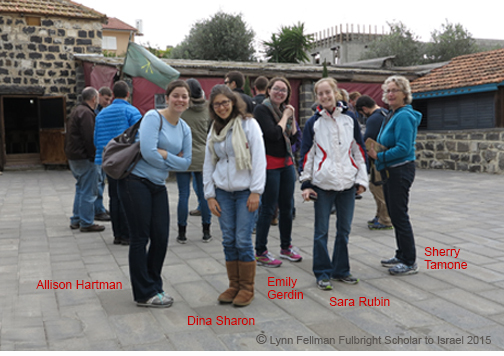 The U.S. – Israeli Fulbright program brings about 25 Americans to various academic institutions in Israel every year. This year five are post doctoral researchers, five are senior scholars and fifteen are graduate students. Since most of us are in Israel now, Fulbright program leader Judy Stavsky arranged for a tourist-like tour of Northern Israel. Dr. Allison Hartman is a post doc Geochemist working in Eilat at the very bottom of Israel on the Gulf of Aqaba. Dina Sharon from Princeton University is a chemist working in a lab at the Hebrew University of Jerusalem. Emily Gerdin is working with Hand in Hand on her project about the influence of ethno-religious conflict on children’s social cognitive development. Sara Rubin from Princeton is doing genomics for cancer at Technion. Dr. Sherry Tamone is Professor of Marine Biology at University of Alaska Southeast. Sherry and I are senior scholars working on our projects with scientists at Ben-Gurion University in Be’er Sheva, Israel.